Kate Middleton gave birth to a healthy baby boy this evening, and London is already celebrating the arrival of the royal heir - come and see the pics! Kate Middleton gave birth to a healthy baby boy this evening, and London is already celebrating the happy news. 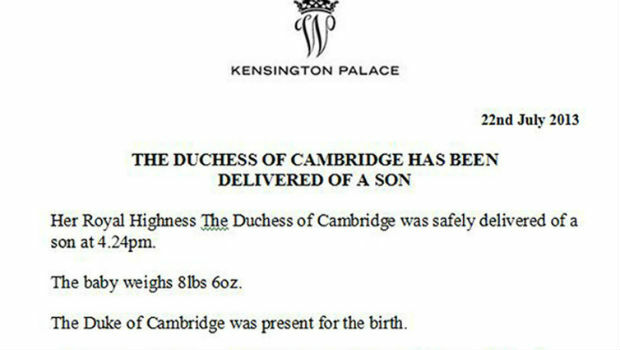 The Duchess of Cambridge welcomed her first son – the third line to the throne – at 4.24pm this evening, weighing 8lbs 6oz. The news was broken to the world at around 8.30pm via a press release over email. Sky News’ Paul Harrison read the announcement out to press and crowds outside the Lindo Wing this evening, to great cheers and applaud from well-wishers and camera crews. And within moments, the celebrations had already begun across the city. 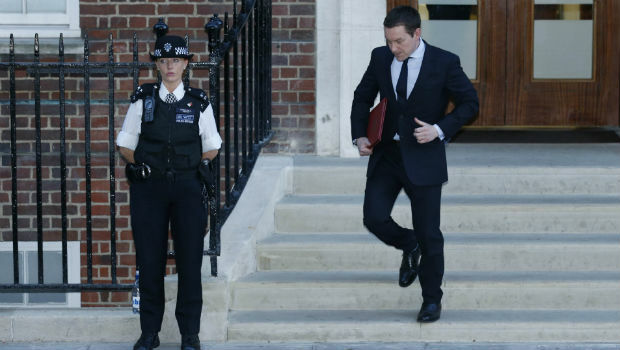 Kate‘s press secretary Ed Perkins was seen leaving the front entrance of the Lindo Wing carrying a red binder with the all-important announcement. 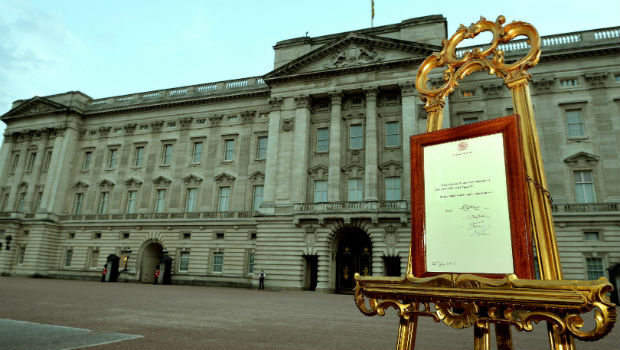 In line with tradition, the notice was posted to a gold easel outside Buckingham Palace, where it will remain until further notice. 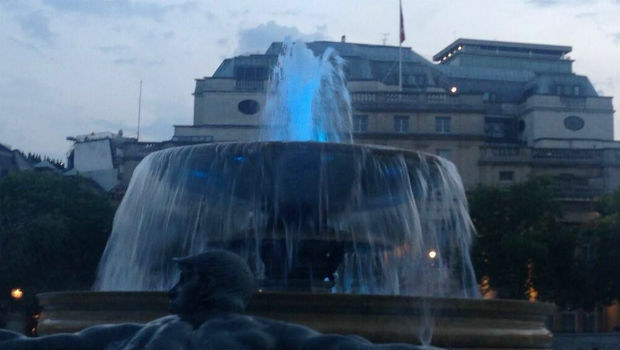 London quite literally lit up when news of the royal baby was announced. 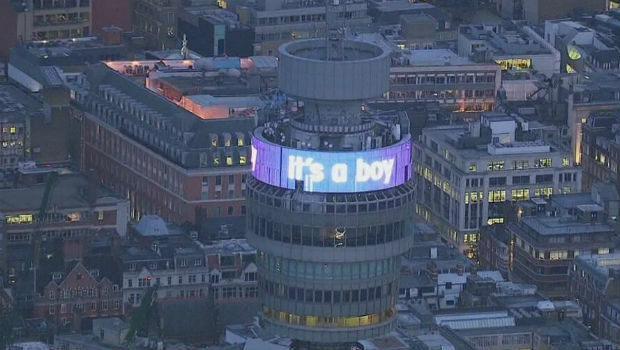 The BT Tower unveiled a light show with flying storks and the message ‘It’s a boy’, while the Tower Of London turned blue, the fountain at Trafalgar Square turned blue, and the London Eye turned red, white and blue to celebrate the happy royal news. 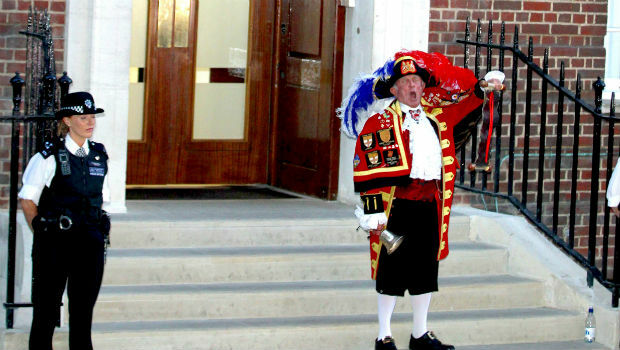 A town crier made a traditional announcement of the royal birth directly outside the Lindo wing, where emotions among the crowds were flying high with the news of the royal heir. David Cameron appeared outside 10 Downing Street to offer his congratulations to the couple this evening. He issued a statement saying: ‘It is wonderful news from St Mary’s, Paddington, and I am sure that right across the country, and indeed right across the Commonwealth, people will be celebrating and wishing the royal couple well. He added: ‘It has been a remarkable few years for our royal family – a royal wedding that captured people’s hearts, that extraordinary and magnificent jubilee and now this royal birth – all from a family that has given this nation so much incredible service. Crowds have gathered outside Buckingham Palace to celebrate the royal birth, but all is quiet outside the Lindo Wing, where the grand entrance has been closed, confirming that Prince William won’t emerge tonight and will stay with his wife and newborn until the morning. We’re over the moon for the Duke and Duchess. Congrats!